Whatever you need to send, shipping supplies are probably a larger part of your business’s budget than you’d like. Especially considering that the smaller and newer your business, the less cash flow there is available. If you’re scrambling to come up with ways to spend less on shipping, try to get your shipping supplies for free. You can get free quality supplies in some unexpected and expected places, and with the help of software, you’ll spend less time worrying about how much you’re spending on shipping. The USPS provides priority mail and flat-rate boxes free of charge, and you can use shipping software to pay for and print postage from your business. There’s no limit to the number of boxes your business can pick up from the local post office or have your mail carrier deliver to you; however, you must, by law, use the boxes to mail things through the USPS. Choosing flat-rate boxes and keeping them organized with software will streamline your shipping process. You’ll know exactly how much each box will cost to ship, and you can ask your mail carrier to pick them up as well. Some of these items are more difficult to find for free, but you can find them all for free if you visit recycling websites. These sites allow people with an excess of almost anything to post that they’re giving away things as opposed to throwing things away. 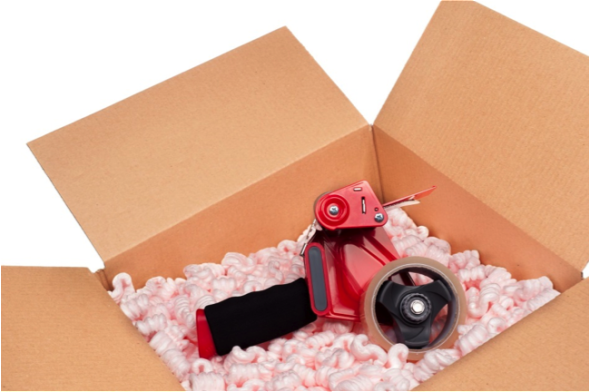 Packing peanuts, boxes and Bubble Wrap will be especially easy to find on recycling websites. You will likely find listings for packing tape, markers and labels if you keep hunting; offices shutting down may have excessive items to get rid of or people who have recently moved. Just be sure the items are available to pick up locally — unless you’re willing to pay for the poster to ship you the supplies in bulk. If you have a preferred shipping company that’s not the USPS or you need smaller or larger boxes than the ones the USPS provides, check with local stores. Most stores, particularly general stores and grocery stores, have hundreds or even thousands of boxes in which they received their merchandise that they then must spend time breaking down and recycling. If you speak with the manager or owner of a local store, she’ll probably be glad to have you take the boxes off her hands, so she and her employees don’t have to dispose of them. If you run a business out of your home or you operate an eco-friendly business, reusing these boxes is a smart idea that may play favorably with your customers. Whenever possible, reuse the packing material you get in boxes sent to you. If the boxes are in good condition, reuse those, too. According to the Collier County Government website, 1,369 tons of Styrofoam packing peanuts enter U.S. landfills daily. Rather than contributing to the problem by tossing out your peanuts and buying new ones every time you need them, reuse the ones you have. If you receive a lot of boxes, you’re basically receiving free supplies you’d otherwise waste. Free postage isn’t an option — but streamlining the time you spend on shipping is. Software allows you to print postage at the click of a button, keep track of packages sent and received and quickly look up postage costs and questions about things like customs forms and international shipping. Spend less time preparing packages for shipping and you’ll save money by letting your employees spend their work hours on other tasks. It may not seem like a big deal to get a free box instead of paying a dollar or two for one, but that kind of savings quickly adds up. Do an experiment; use your software to catalog the number of boxes you send out each week. Then, multiply that by how much you’re spending on boxes and packing materials. Imagine not having to spend a penny on shipping supplies — and think of how much you’d save over the course of a year! About the Author: Debra Jackman has been a small-business owner for the past 15 years.